Blaze, White Blaze:	A two by six inch square of white paint ocassionally and wholly accidentally left on a tree by the mythical maintainers. These are generally thought to indicate that: someone went this way before me and they apparently own paint. Blue Blazer:	A hiker who frequently substitutes blue blazed routes paralleling the official AT. These may be: shorter, flatter or more scenic than the official route. Many blue blazed trails are in fact vestiges of earlier AT routes and as such frequently head directly through popular resupply points avoided by the modern "scenic" AT. Flip-Flop Hiker:	A hiker completing the Trail in a discontinuous hike within a single year. Flip-flop hikes may begin at either end of the Trail (i.e. Leg 1 North from Georgia, Leg 2 South from Maine) or may begin a convenient midpoint on the Trail (Harpers Ferry is popular) (i.e. Leg 1 Mid-point North to Maine, Leg 2 Mid-point South to Georgia). GA-ME, GAME:	Short hand for Georgia to Maine. A notation used in trail registers by Georgia to Maine thru-hikers. Go-lighter, Ultra-lighter:	A hiker who carries an extemely light pack (typically 15-25 lbs). Ultra-lighters use light-weight tarps in lieu of tents and favor sleep sacks (silk and fleece liners) over traditional bags. They are frequently cold and always hungry. ME-GA, MEGA:	Short hand for Maine to Georgia. A notation used in trail registers by Maine to Georgia thru-hikers. Northbounder (NoBo):	Short hand for a Georgia to Maine thru-hiker. Pointless Ups and Downs (PUDs)	Hills and full blown mountains senselessly included in the path of the Appalachian Trail. These features are frequently remote from the most natural trail route requiring exquisite and serpentine contortions in the path to deliver the hiker to the base of targeted monolith. Section Hiker:	A hiker who seeks to complete the Trail in large sections over several years. Section hikers can take two, three or as many as twenty years (at 100 mi/year) to complete the Trail. Southbounder (SoBo):	Short hand for a Maine to Georgia thru-hiker. Trail Names:	The fanciful (some would say Super Friends-like) monikers adopted by or assigned to Appalachian Trail hikers. These names are used in trail and shelter registers and in actual conversation among hikers. An odd convention of the Trail to some, trail names are memorable and help hikers sort among the twenty Johns, thirty Davids and twelve Anns they are likely to meet in the course of months or weeks on the AT. Thru-hiker:	Generally used to mean a hiker who has walked the Trail from end-to-end in a single (normally continuous) hike. 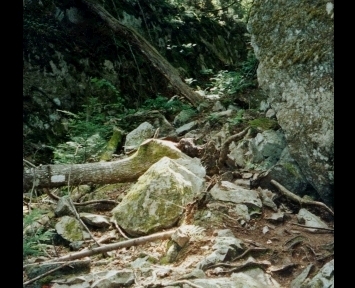 Often includes hikers completing the trail in a single dis-continuous hike within a single year, and may include hikers completing the Trail in large sections over two or three years. Ultra-purist: A hiker who scrupulously insists on carrying her full pack not only past every white blaze on the Trail but over every inch of soil demarcated by those blazes. Unlike simple purists, ultra-purists consider dirt under a large fallen tree to be "part of the official AT" and will literally tag the space underneath from either side whenever forced to circumnavigate a blowdown. Weekend Hiker, Weekender:	A hiker who is out for 2-3 days and is more or less incidentally hiking on the AT. Frequently includes large camp and church groups. Often includes Boy Scout troops. Has been known in Pennsylvania to include penal boot camp outings. Yogi, Yogi-ing:	In its strictest meaning, the act (or art) of obtaining desired goods or services without directly asking the candidate provider. In general usage, the act of obtaining desired goods of services from a third-party by any means including non-fatal force. Zero Day, Taking a Zero, Zeroing:	A day in which a hiker walks no "credited" miles (generally spent in a town or hostel). Zero days may be for resupply, recuperation and/or recreation. Hikers taking too many zero days risk "losing their hike" and/or becoming yellow blazers. 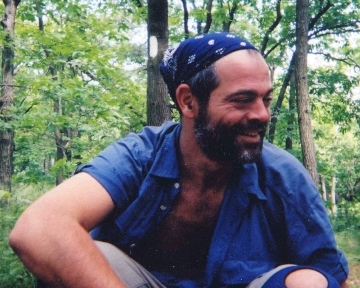 How I Accidentally Thru-hiked the AT: On May 7, 2002 I walked out the back door of my house near Washington, DC for what I then anticipated would be a 430 mile hike to Bear Mountain, NY via portions of the C&O Canal and the Mid-Atlantic portions of the Appalachian Trail. Six months, 2200 miles and one major change of direction later, I had managed to stumble the entire length of the Appalachian Trail (officially 2168 miles for 2002) from Mt. Katahdin in Central Maine to Springer Mountain Georgia (which I summited on November 24, 2002). Along the way I acquired a trail name ("Faceless"), made some wonderful friends, enjoyed serial acts of kindness, climbed some enormous mountains and took in endless jaw-dropping views. I spent over 150 nights in the woods. I acquired minor -- and hopefully temporary -- nerve damage in both hands, stress fractures in both feet, and what I imagine will prove to be a permanent and piercing pain in my knees. I hiked through five pairs of shoes and three sets of tips on my trekking poles. I lost 45-50 lbs in the course of my hike and was forced to downsize my clothing three times. I saw five bears (and was chased by one -- not avidly), three moose, one mountain lion and two rattlesnakes. I saw wild turkeys, was attacked by a pheasant and startled countless deer. I experienced temperatures ranging from a daytime high of 101° (Massachusetts, July 3) to a nightime low of 14 ° (November 17, N. Carolina). The last 600 miles of the Trail was the most intense sustained challenge of my life. There were times when I genuinely wondered if I would make it. In early October the rain began. Sometimes it was sleet. Sometimes it was snow. In continued without mercy 3 out of 5 days for the next 6 weeks. I hiked wet, and so cold I could not use my hands, for days on end. My body was breaking down. My weight was at an adult low of 165 lbs. My immune system was on permanent vacation. Days were short and growing shorter. I was pretty regularly hiking all available daylight to make my miles. Up an hour before first light, out by 7:30 am in by 5 pm. Mummied up by 6:30 pm and up again at dawn. The novelty of hiking 9 hours a day was dead. A ghost. I sometimes fantasized about taking an extended break, finishing up next Spring. But quitting was never really an option. I simply continued to get up each morning, scrape the ice from the seat of another privy and chip away at another day of hiking. It was bewildering to wake up one morning and find myself 14.7 miles from Springer. It was a beautiful day. The temperature probably reached 70° in the direct sun by mid-day. I was in the USFS parking lot .9 miles from Springer's summit by 3 pm. Twenty minutes, one wrong turn and one quick jog later I tagged the plaque at the southern terminus of the Appalachian Trail. I posed for the obligatory photos, signed the register and began one last short walk out of the woods. It provides a pretty good overview of the hiking experience and each of the sections hiked. 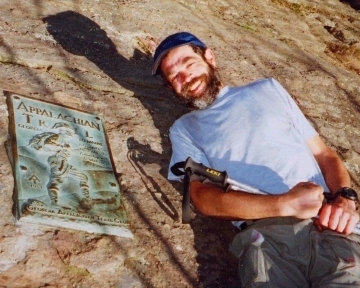 On May 7, 2002 I strapped on my backpack and walked out my back door for what I anticipated would be a 430 mile hike from Potomac, MD to Bear Mountain, NY along sections of the C&O Canal Natl Historic Park (50 mi) as well as the Mid-Atlantic portions of the Appalachian Trail (380 mi). I completed my initial hike on June 13, 2002 about a week shy of my anticipated 6 week mark. During my initial section, my most typical day was 14 - 15 miles. I did a number of 17+ days, two 20+ days. Took two full days off in five weeks and did maybe 4 slack days (<10 miles) mainly to time arriving in a town to get my drop box. I lost 15-20 lbs., sprouted a full beard and literally walked through the titanium tips on a pair of hiking poles. In addition, my friend Chris (and his pup Toast) visited me from the real world for a 50+ mile section in central Pennsylvania. And although I think he was sad to be done with his walk so soon, we did some good miles (one 17+ mile day), walked the pooch stiff and generally had an awesome hike. I literally hiked out my back door and walked to the AT via the C&O Canal Natl Historic Site towpath. I made it into Harper's Ferry in about 3 1/2 days doing about 12 miles a day. My hike began with a 4 mile road walk during the early afternoon exurban rush hour. The C&O towpath is as close to flat as is possible while actually gaining altitude (about 8' every 5 to 10 miles). It was a terrific (if deceptive) warm up hike and the Potomac River is a real treasure. I saw heron, geese, ganders and goslings. I saw three startled deer dive into the murky canal, and had a generally quiet and solitary walk to West Virginia. I did not encounter a lot of altitude in absolute terms. MD and PA maxed out at around 2000'. The Trail in MD and PA consists largely of steep but entirely manageable climbs to get up on ridge you then followed for 10 to twenty miles. The ridges, however, consist of the most vicious friggin' terrain in the universe. Mostly it was the rocks. The PA leg is notorious for them, and it's just hard to explain. Sometimes there is not a level surface in seven miles. Some of it was just miles of boulder hopping, climbing or scrambling, but the worst were these pointy rocks that stud mile after mile of the trail. By the time I hit NJ I had gone through the titanium tips on my hiking poles and a pair of New Balance trail runners (which were a mixed decision in any case -- although I now have bullet proof ankles and a new pair of 805s). That said, PA had some wonderful views, some sweet, cold mountain springs (until the end) and wonderfully maintained shelters and tenting spots. After Pennsylvania N.J. was a welcome cakewalk across rolling hills and bog bridges. Although, the temperature increased and water quality and access declined commensurately. N.Y. apparently used to be easy until too many people complained and they managed to reroute the trail over every goddamn summit they could find. Not ridges mind you. Base -- Summit -- Base. Did 7 summits top to bottom in 14 miles on Monday (6/10). And then got chased (not avidly) almost a half mile back up the trail by a bear when I tried to take a break and score some much needed water at a spring. Towards Katahdin: By the time my friend Chris picked me up at Bear Mountain on June 13, I knew I was going to try to make it to Katahdin. I was in the best shape of my (early middle-age) life and was sure it would be a long time before I again had the courage and opportunity to walk away from such a huge chunk of my day-to-day existence. I was certain I would make it as far as Hanover, NH and hoped I would at least make it to Gorham, NH on the other side of the White Mountains. I quietly dreamed I might cover the final 280 miles to Katahdin. 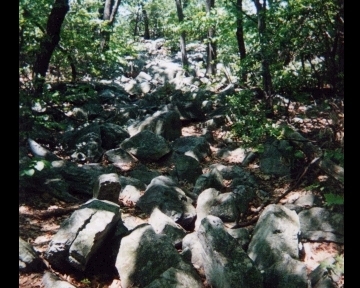 I returned to the Trail at Bear Mountain on June 21, 2002 and followed the blazes right through the Bear Mountain Zoo (free entry for AT hikers). I took a couple of days to fully regain my trail legs and the heat (a pretty constant theme through the rest of the hike) made my first few days back a slog. The NJ/NY Trail Conference is a bit "Feature Happy". Nothing is exceptionally challenging, but if there is a ridge or a knob in screaming distance, they must take you up over, down and around it. At least once. This is neat ... the first 50 times. But, hikers like to complain, and despite the obstacle course I was back on a 17 mile/day average pretty much out of the box. I also met the Woodman, who would be my hiking partner for most of the next 350 miles. At the Connecticut state line another hiker (Kenneth the Pipe Lipman) completed 13 years of section hiking the Trail. His wife had tied a ribbon across the trail to the parking lot and brought a six pack of cold beer. I met the Pipe crossing the Hudson out of Bear Mountain. And even though we hiked together for only a few days, it was really pretty moving to be there for his triumphant moment (a sensation I would experience a few more times on the way to Katahdin). By the time I hit Connecticut I had pretty much established my summer hiking routine: up by 5 am, hiking by 6 am, 12 miles by noon and crawl the remaining miles through the heat of the afternoon. This pattern -- known on the Trail as 12 by 12 -- gets most of the hiking out of the way before the real heat starts. Even so, it was already pretty warm (and always humid) when I set out at 6 am most days. I was usually in camp by 5 or 6 pm. Days were long, and this left a fair amount of time for dinner and conversation before bed which usually came around 8:30 or 9. Water was a constant topic. We mainly took our water from streams, and there were plenty of streams. But most days we went through a gallon and half just hiking (and at least another half gallon at camp) and we were routinely counting the minutes to the next reliable source. Camping was entirely guided by water. I required 2 quarts between arriving and bed, and never left camp with less than two quarts on my pack. Connecticut is nicely maintained. Good trail bed with some moderate (700 - 1000 foot) climbs and descents which -- with the Woodman's encouragement -- I began to take without breaks with an eye towards training for the inevitable (and much more serious) climbs in the White Mountains. We hiked Massachusetts in the hottest part of summer, culminating in a traverse of the state's high-point, Mt Greylock (3500'), on July 3 in 98° heat. And yet despite the heat, we kept up a 17 - 20 mile a day pace, saw some beautiful sights, stayed in some great places (pancakes and homemade maple syrup at the AMC's Cabin at Upper Goose Pond, MA being a highlight) and hiked with some great folks: Blackhawk & Squaw, Jiffy and Spyder & the Marine among others. I also ran into friends from the first part of my hike: Choo Choo and Piper. Unfortunately, I managed to pass the Potato Man when within half a day of catching up, he took a quick break from the Trail to visit with friends in Great Barrington MA. The walk through Vermont was one of the high points of my AT hike. The temperature moderated somewhat, and I was in optimum condition to meet the constantly steepening grades head on. The AT overlaps with the venerable Long Trail (completed 1921) for the first 100 miles of Vermont. This section has sensible routing, generally good trail bed, pretty birch and pine forests and somewhat erratic blazing. We picked raspberries, hit some on-trail snack bars and found some great spots to swim on a warm day or two. My most memorable physical day was traversing Mt Killington. I had hiked ten miles to the base by 9 am and was sitting another 2000' up sipping cocoa in the summit snack bar by noon. By 4 pm that afternoon I was 18 miles and one hitch down the road sipping a Guinness Stout at the Inn at the Long Trail (and drunkenly pitching my tarp across the road by 6 pm). The folks in Vermont were also great. Although re-supply was frequently 5-10 miles off trail, it was easy to catch a hitch from friendly locals. In fact in some places you didn't even need to stick out a thumb. The last 50 odd miles of the Trail in Vermont (which heads more or less due east to New Hampshire) is "pretty" but a bit tedious. The heat came back up again at Killington and this section included a lot of steep hills in constant succession. 500' here, 700' there. It all begins to add up. Crossing the Connecticut River from Vermont into Hanover NH rates as another high moment. Woodman took a spontaneous bath/laundry session off the Dartmouth staff dock when we got in. Folks honked and waved, and southbounders (SoBos) shook their hiking poles in greeting as they went the wrong way out of town back towards Vermont. The Trail in New Hampshire presents some extreme challenges as well as some extreme rewards. North of Glencliff (mile 45) the trail bed is from hell. Rocks and roots. Slick granite ledges. Small pixies stabbing your shins with pikes. Screaming, un-switched 2500' climbs are routine as are pounding mirror image descents. Climbing off Mt Madison at the end of the Presidential traverse, the Trail drops 3000' in about a mile (the first 1/2 mile on bare rock above timberline). Still, the Trail is frequently above treeline and the views stretch over endless mountains (130 miles on a perfect day). The traverse of the southern half of the Presidential ridge takes you through 5 miles of true alpine meadow with the rich stink of dwarf spruce, mountain azalea and a delicate white flower that may or may not be mountain daisy. I took two days in Hanover, the first w/ my sister who lives 1 1/2 hours east and another helping my cousin who was conveniently moving to Hanover the day after I hit town. And as result, and despite hiking the next 45 miles in two days, I permanently lost the Woodman (who eventually summited a week ahead of me). This little hike-a-thon however took me to the edge of the White Mountains and what would prove to be the first truly challenging terrain of my walk. In the next 8 days I would traverse more than 100 miles over 5 major ridges including the magnificent Presidential Range. My two day traverse of the Presidential Range I crossed the Presidentials in a two day, 26 mile hike under spotless (but icy) skies. After climbing 2500' to the summit of Webster (3910'), the Trail crosses 5 miles of alpine meadow to the base of Mt Washington's summit cone (another 1500' up) where I spent my first night in an AMC hut. I was on top of Washington (6288') by 8 am of day 2 (only one family up by the Autoroad who kindly snapped my picture). I picked my way across the scree and boulder strewn deathscape of the 5 1/2 mile Madison Loop by noon, and scrambled my way over and down Madison (5363') (700' up and 3000' down) into Pinkham Notch by 4 pm. One shock to many AT hikers (myself included), having completed the Presidential Range: you are not done with the Whites. Next comes a 2000' climb out of Pinkham Notch and over the Wildcats (peaks E-A)(4300'), Carter Notch, the Carters (Carter Dome (4832'), Carters Middle and South), Imp, Moriah (4049') and finally a 3000' x 6 mi. descent to the beckoning arms of Gorham NH. Maine is a hiker-grinder. From start to finish. Sometimes it's beautiful: endless lakes, the cry of the loons and moonless starlit nights viewed from a mountain col.
Mostly though it's just plain brutal. The first 100 miles is composed largely of serial traverses over un-switched, rain slicked granite monoliths: the Mahoosic Range (Mt Success, Mt Carlo, Goose Eyes East and North, the Notch, the Mahoosic Arm et al. ), Old Speck, Bald Pate, Old Blue, the Saddlebacks, Sugarloaf, the Spauldings and any number of minor peaks in between. The last 100 miles (the "100 Mile Wilderness") is frequently tedious and constantly challenging. The 80 miles in between are okay. Particularly the Bigelows which, while steep, are a pretty and rewarding hike. My friend Crusader and I spent a night camped in a col at 3722' between twin summits and were rewarded with a moonless and unimpeded view of the Perseid meteor shower. Maine's ponds and lakes also presents some terrific swimming opportunities (as long as you remember: too shallow for fish = leeches). This was good as Maine enjoyed the same heat wave baking the rest of the East Coast and much of the walk was in temperatures 90° F and above. Ironically, because of the "remote" nature of the AT in Maine, the state has developed a very thorough (and highly competitive) hostel system catering to hikers in the extreme: Shuttles to and from the Trail, slackpacking from road-head to road-head. Bunks are $10-15.00/night (showers and laundry are extra). They all feature at least basic cable and most offer Internet access. 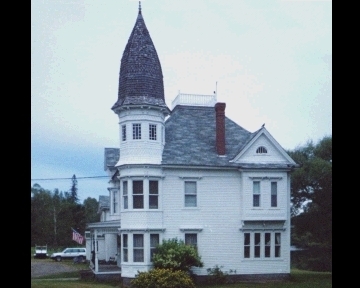 Andover ME is a particular hiker black hole with three competing services. Many a wounded hiker -- myself included -- has found himself taking multiple nights (3) in a bunk room, hiking 15 mi from road-head to road-head with a day pack, finishing by 2 pm and back sucking down pizza and watching cable by 3. I met Crusader and Chile Pepper in Andover and would summit Katahdin with both of them. Crusader, however, became my day to day hiking partner for the next 200 odd miles. We kept each other to 15-17 mile days over some pretty rough and occasionally debilitating terrain. We took a healthy run at Maine's mountains some days, and we did one breathtaking 23 1/2 mile day in the Wilderness, but mostly we just slogged through it 8-10 hours a day. We made it to Monson ME (the "Last Trail Town") on the edge of the 100 Mile Wilderness on August 17 about 2 1/2 weeks after I first hit Maine. We did the "Wilderness" in 5 1/2 days, stopping our fourth night at White House Landing for re-supply (I added 12 candy bars to my kit). The Wilderness is less of a wilderness than it once was and probably only ever felt like a wilderness before they took the Trail in Maine out of the valleys and passes and rerouted it over every damn mountain in the state during the 70s. Following his 3rd thru-hike in 1997, the late Earl Schaeffer (who became the first person to successfully complete the AT in a single season in 1948) had many useful things to say on this subject. At any rate, it is criss-crossed by logging roads (there is even some parking) and populated by a surprising number of weekend and section hikers dropped off at the road heads by one or more of the enterprising local vendors. That said, the Wilderness ain't for sissies (and is pretty tough on allegedly trail-hardened hikers). It includes mile upon mile of everyone's least favorite trail features: rocks-n-roots, hand-over-hand climbs and tree clutching descents as well as a near total absence of foot bridges (this was fine but challenging, hopping from rock to rock in the late summer drought). We reached Abol Bridge, the end of the Wilderness and the boundary of Baxter State Park, Katahdin's home on August 22. We ate pink hot dogs and microwaved cheeseburgers and washed them down with lemon flavored malt beverages scored by Chile Pepper at the commercial campsite by the bridge (where we also spent the night). Baxter provides space for 12 "long-distance hikers" in the Birches, a brand new pair of shelters and tent platform .25 miles from the start of the Hunt Trail to the Katahdin summit (which is the route taken by the AT). All of the thru-hikers at Abol were a tad hysterical over assuring themselves a slot, and we were all at the sign-in board a mile north by 5 am the next morning (needless to say, there were all of 5 long distance hikers in the park that day). The Birches site was a quick 10 mile hike into Baxter. We had stashed our gear, and Chile, Crusader and I were lolling in the sun by the Katahdin Stream Ranger's Station by noon, planning the next day's assault on Katahdin. The summit is about 5 miles north and 4100' up from the Katahdin Stream trailhead where we would start the next morning. It would be a Saturday in August. The reserved campground was already packed and people would be lining up by 3 am to get into the park at 5 am for the day's hike. The summit would be a cattle pen by 9 am. Cars were in fact idling in the parking lot as Crusader and I made for the Hunt Trail a little after five a.m. the morning of the 24th. The long-distance hiker site was already abandoned (we all left our gear at the ranger station -- where I also scored a daypack for the climb), and in fact the other three hikers (Chile, Bucky and Trish the Dish) had all signed the register at the trailhead at 5 am about 20 minutes up on us. Crusader ran at the hill right off. We pretty quickly caught Bucky (who has been hiking 300 odd miles w/a broken toe) and then Trish, and then finally Chile who then hiked w/us to the top. It was a great climb. Ropes and iron foot/handholds. We put up our hiking poles after the first 2 miles, and then took them out again to cross the Tablelands and the last half mile to the summit. We were above treeline for about half the hike and there were just endless vistas of lakes and the distant mountains we had crossed to get there. The sky was overcast all day, but the air was dry and the views were extremely clear. Chile (who was completing a 2168 mile thru-hike, GA-ME) took the lead to the summit which we reached at 8:10 (2 hrs 50 min). It was cold up top. I was wearing gloves but not a shell. But, for the time being, we were alone. We tagged the sign. We took the money shots. High-fived. Ate candy, and bitched about the 5 un-credited miles we were about descend. At 8:40, the first of day hikers reached the summit and we decided it was time to start heading down. It took me more than a week to make my way home after summiting Katahdin and another week to organize my supplies and get back on the Trail at Harper's Ferry. I finally set out south towards Springer on September 11 with a 12 1/2 mile hike from Harper's Ferry to the Potomac Appalachian Trail Club's Blackburn Center about five miles past the West Virginia/Virginia border (one state down). I experienced a month's exposure to extreme drought followed by six weeks of near constant inundation. I experienced temperatures ranging from daytime highs in the 90s (weeks 1-4) to night time lows in the teens (weeks 5-10). I crossed over 6000 feet four times and over 5000 feet too many times to count. I crossed bald summits in howling winds and sleet. I met some wonderful generous people and made some terrific friends among the Southbound Thru-hikers, in particular Brother who I first met in the White Mountains and would hike with on and off 800 odd miles from Rock Fish Gap VA to Gooch Mountain GA.
Much of the first 400 odd southbound miles of my hike (roughly through Central Virginia) was spent studying detailed and often ominous water supply notes left in the registers by northbound sectioners and other southbound Thru-hikers. The Near and Mid-South has experienced a three (and in places seven) year drought. As a result reliable water sources were frequently 10 - 20 miles apart. I grew accustomed to carrying water for long distances. And although I treated and eventually filtered, I grew used to consuming vast quantities of dirt whenever I eagerly swigged the contents of yet another silt choked mud puddle. Then in mid October the drought abruptly ended. For the next six weeks and six hundred odd miles to Springer Mountain it rained, sleeted or snowed 3 out of 5 days. Water, thereafter, was not a problem. A boxed, piped spring in the Mt. Rogers Recreation Area in Southwest VA was flowing so hard it could be heard under its cover from 50 yards away. Cold and wet, however, became a constant theme. After my socks froze solid for the third time in the Smokies, they did not come off my feet for 130 of my final 160 miles (one washing at mile 130 and back on 'til Springer). Although I expected to march through the South like a turk, and although I did my share of ill-considered 20+ mile days, I also did my share of well-earned 11-12 mile days and my average -- and in fact most typical day -- was right in the sweet spot of 15-17 miles. The first part of my hike was unhurried and somewhat solitary. Although I met some very nice weekenders and section hikers, and although I found register entries from folks just one or two days ahead, I walked the first 161.9 miles from Harper's Ferry to the southern boundary of the Shenandoah's at Rock Fish Gap without seeing a single other thru-hiker. The Trail south of Harper's Ferry is a bit of a notorious roller coaster. Nothing big, it is alleged to consist a relentless series of 500' climbs and descents. Although the Trail does get a bit bumpy about 13 miles out, this like so many AT features proved more bark than bite, and by the second day out, I felt my legs returning to smooth long distance operation. Conversely, the alleged ease Trail through Shenandoah National Park (SNP) is clearly a case of pain having no memory. Yes much of the trailbed is wide and clear. Yes the grade is generally kind. However, there are some big enough hills in the park and I found myself crossing over at least two or three of them every day despite a somewhat laid back pace (I went through SNP in four 13 mile and two 20 mile days). That said, I sure did appreciate the services, stopping at every wayside, campground and lodge for grub I managed two full on seated meals and two more on the run. Although water was an issue pretty much from day one (and really serious by the southern half of SNP) the weather was otherwise clear and moderate, and I had very good views through most of the Shenandoahs with a light fog settling in for my last two days. I hiked out of SNP in a 20 mile day to Rock Fish Gap making the local visitor's center just before 4:30 and a short but heavy rain. The visitor's center arranges shuttles to Waynesboro, Va 3 miles west of the gap, where I -- dry but pungent -- checked in to the Quality Inn for a day of resupply and relaxation. The first part of the Trail in Central Virginia passes over some pretty but steep and/or endless hills: the Priest (3500' x 1 mi) and Apple Orchard Mountain (3500' x 13 miles) being stand-outs in the respective genres. The second part of the Trail in Central Virginia (roughly from Catawba to Pearisburg) involves serial ascents and ridgewalks, generally one but sometimes two a day. These climbs are generally moderate, 1500-2000 feet being typical. And although some of the ridges are a little rough, the walking was usually pretty easy. The Trail in Central Virginia passes through gorgeous (and frequently active) pastures and crosses the first truly impressive balds of a Southbound hike. My first encounter with an open, grassy summit at Cold Mountain, Va was unfortunately typical: 20 yards visibility and horizontal rain. It was however beautiful all the same. The moderate -- and generally dry -- weather persisted through Catawba, Va (mile 690) where I secured truly all I could eat at the Homeplace Restauraunt and spent the night at the Four Pines Hostel drinking homemade brandy from an old fruit jar, with our host Joe Mitchell. In the seventy odd miles from Catawba to Pearisburg, the weather began to turn. First the wind came up and the temperature dropped precipitously. By the time I made it to Rice Fields Shelter 5000' above Pearisburg, I had already kept my 55° REI Sleep-sack three nights too long. The temperature that night was headed for the thirties and I had made desperate arrangements to get my 20° bag over-nighted to Pearisburg where I very much hoped to secure it the following afternoon. Despite falling temperatures, the walk through Southwest Virginia provided some of the prettiest hiking on the Trail. The Mount Rogers Recreation Area/Grayson Highlands at the southern end of the section are among my favorite places on the AT. 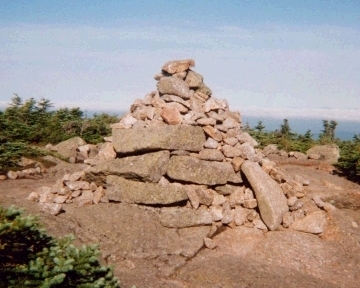 The Highlands include over fifteen miles of open ridge and summits, much of it above 5000'. They include endless views and lovely walks across mountain grasslands, as well as herds of Shetland ponies brought in to keep the meadows and summits open. That said, and although we did get two glorious days of weather in the Highlands, the cold that had set in before Pearisburg was joined by a steady rain that would persist for something like 3 out 5 days all the way to Georgia. My long anticipated entry into Damascus (mi 455) was a bit of a let down. I had crossed the more than 500 miles of trail in Virginia, was more than half-way done w/ my southbound hike and well over 3/4 of the way done with the Trail overall. I was however cold and tired, and unfortunately in late season Damascus -- with the very notable exception of the Mt Rogers Outfitter -- turns out to be largely shutdown. Still, for the first time I could genuinely see that I was getting somewhere. I was, after all, more than half-way done w/ my southbound hike and well over 3/4 of the way done with the Trail overall. I switched out my ultra-light GoLite pack (15 oz) for an Osprey Aether 60 (3 lbs. 7 oz.) to accommodate my new, bulkier and heavier cold weather load (from 25 to 35 lbs). I spent a beery night with a passle of my favorite Southbounders (including, but not limited to: Brother, Poppa Husker, Flutterby and Brown Trout) and spent two nights at the Methodist hostel (the Place) amidst its conversion to a haunted house for Halloween. As I learned my first night out of Damascus, those shovels leaning against the shelter are not entrenching tools. Tennessee contains almost no privies. This is apparently a tradition of the Tennessee Eastman Hiking Club which provides otherwise glorious maintenance of the first 70 odd miles south of Damascus. I will simply state my position that the foulest privy on the AT is better than catholing in the sleet. Tennessee and North Carolina contain some of the highest and most beautiful peaks on the Trail: Roan Mountain in North Carolina (6200') and Mount Guyot in the Smokies (6400') being two of the more stellar climbs. I hiked the first 175 miles of this section (from Damascus, VA to Hot Springs, NC) without a break in 11 days. I hiked the first 115 miles in two sections: one 41 mile section to Kincora, a donations only hostel near Hampton TN (mi 413.9) lovingly maintained by Pat & Bob Peoples, and one 75 mile section (including Roan) to Uncle Johnny's Nolichucky Hostel at Erwin TN (mi 338.8). I remember steep ascents, wind blown rain on open summits and a misplaced patch of arboreal forest at the top of climb that began in thickets of rhodedendron. I slacked one 20 mile day out of Kincora, and otherwise kept up a 15-16 mile pace reaching Erwin almost exactly one week after leaving Damascus. I hiked on from Erwin the following morning and continued on 3 1/2 days and 68 odd miles to Hot Springs, NC (mi 270.9) for a long anticipated break before entering the Smokies. I spent two nights at Elmer's Sunnybank in Hot Springs. The Sunnybank is a wonderful B&B hosted in a historic house in "downtown" Hot Springs. Elmer has an amazing library. He provides a discount rate for hikers and serves multi-course gourmet, vegetarian meals, blending thru-hikers and regular guests in a lively salon like atmosphere around his generous table. Although the weather for the first 30 miles out of Hot Springs was just about as dreadful as it comes -- I spent 2 hours one day drying out in a tee pee, stoking an experimental firepit with a very nice man named Curtis -- it managed to clear just in time for my hike into (or more accurately: up into) the Smokies. For the first three of the five days it took me to go through the 70 miles of the Great Smokey Mountain Natl Park, it was genuinely sunny (although a little crisp) with clear and open, late Fall views (360° in some spots). It had snowed at upper elevations the night before I entered the Park, and I found myself hiking in a t-shirt through two or three inches of accumulation and piles of fallen hoarfrost. On day three I reached the high point of my hike, literally. I crossed over Clingman's Dome which at 6600' is 200' higher than Mt Washington. And although it also has a road, its enclosed summit -- timberline is at about 11000' at southern latitudes -- and tourist choked observation tower were somewhat less dramatic. It is, however, both the center point of the AT in GSMNP as well as the highest elevation crossed on the Trail. The weather turned for the southern half of the Park, fog and sporadic light rain punctuated by a spectacular thunderstorm my final night (complete with 50 mph winds and the steady thump of hail on the shelter's tin roof). I picked up a fierce bug in the Smokies that left me very concerned about my ability to make it to Springer in time to get home for the holidays. My mileage as I ground towards Georgia fell into the low teens. Although I took a full sick day and although the grade was in fact very kind, my pace frequently fell below 2mi/hr for my first week out of Fontana Dam (mi 161). Beyond the Nantahala (mi 130), the weather turned worse than foul: daytime temperatures in the mid-thirties, night time temperatures in the teens and twenties, rain and sleet followed by icing and snow at night. It was just comically awful. My friend Chris came to hike with me a few days to offer moral support. We met just north of the NC-GA border on November 18 at Standing Indian Shelter (mi. 82). We hiked together for two days, crossing into Georgia our first day out and making a quick stop in Hiawassee (mi. 66.8) our second day for my final resupply. Perhaps it was the company, perhaps it was the biscuits & gravy in Hiawassee, but I found my health improved, and despite a somewhat grim weather forecast picked up on an AM Christian Station, the skies began to clear even if the temperature did not immediately climb. After Chris left, I decided to put a little effort towards getting to Springer, and although I had planned a series of easy 11 and 12 mile days I ratcheted my miles back into the high teens to finish out the trail. The Trail in Georgia gets a rough rap from Northbounders who insist it is a relentless series of primitive unswitched climbs. Nothing could be further from the truth. Georgia is certainly a little bumpy, but it is for the most part nicely contoured and in fact currently bypasses two rather large climbs shown on my 1995 era profile. I didn't do any long days, but I did a healthy 18 mile day to Neels Gap in time for a free pint of Ben & Jerry's and a luke warm bed on what would prove to be my last sub-20 night in the South. My last thirty odd miles from Neels Gap to Springer were glorious. Although my first day started out in the low 30s with gusting winds as I climbed out of the gap and over Blood Mountain, by 11 am the temperature had climbed into the low 60s and probably near 70 in the direct sunlight before the day was out. And even though I took my time to bask by the Trail in the warm sun, I was at my last AT shelter 16 miles on by 3 pm. At 5 pm some good friends, including Brother, rolled in for the night. I was glad to spend my final evening with friends (although I was sad to learn they didn't plan to summit for at least another day). But I was good and tired, and despite the company and a nice fire, I was in my sleeping bag and well on my way to sleep by 7 pm. I was on the Trail by 8 am the next morning for my final 14.7 miles to Springer. It was another glorious day, and although I hiked fast when I was moving, I took a bunch of breaks to enjoy the sun as well as a leisurely lunch at my half-way point, Hawk Mountain (mi 7.5). With the mileage in the single digits, I could truly smell the end. The Trail was a ghostworld of people I would never thru-hike with again. I kept thinking of my northbound companions (Piper, Potato Man, Woodman, the Porkchop, Chile ...) how new this all was to them as they passed through these same thickets of rhodedendron, how many experiences were still ahead for them. I hit the USFS parking lot .9 miles below Springer's summit a little before 3 pm. My friend Choo Choo had just arrived to wait for me. We chatted for a moment. I debated ditching my pack, but decided to take it up. I promptly turned the wrong way out of the lot and had walked a good tenth of a mile before recognizing that I would not find the Trail. I jogged back to the parking lot and immediately saw where the AT continued more or less directly across the road. I turned back onto the Trail at 3:08 and ran to the summit in twelve giddy minutes. I tagged the plaque at 3:20, posed for the obligatory photos and began my final uncredited walk back down to the parking lot.